Sixteen-year-old Annie Collins is one of the ship's closest neighbors. Once upon a time she took every last theory about the ship seriously, whether it was advanced by an adult or by a peer. Surely one of the theories would be proven true - if not several of them - the very minute the ship decided to do something. Annie is starting to think this will never happen. One late August morning, a little over three years since the ship landed, Edgar Somerville arrived in town. Ed's a government operative posing as a journalist, which is obvious to Annie - and pretty much everyone else he meets - almost immediately. He has a lot of questions that need answers, because he thinks everyone is wrong: The ship is doing something, and he needs Annie's help to figure out what that is. Annie is a good choice for tour guide. She already knows everyone in town, and when Ed's theory is proven correct - something is apocalyptically wrong in Sorrow Falls - she's a pretty good person to have around. As a matter of fact, Annie Collins might be the most important person on the planet. She just doesn't know it. If you enjoyed Not Alone, you should enjoy this one, too. It has the same real-time pacing, UFO subtext, and a fascinating lead character. The story takes place in a small town, and has a host of locals and others who bring a folksy humor to the tale. But where Dan Macarthy was an introverted loaner with a UFO fixation, Annie is clear eyed, intelligent, and always sensible -- no matter what. That's pretty good for a 16 year old kid who lives next door to a UFO! I found her to be endlessly entertaining and cleverly written. It's been 3 years since the spaceship landed when the book begins, and it has been sitting in an open field for all that time, doing nothing. Not moving, not making a sound, and no one appears to be inside. But the military isn't taking any chances, and has set up shop in the area to guard the ship and prepare for the day when something -- anything -- happens. Across the road from the military fence around the ship, is an assorted group of misfits and odd-balls in camper vans, keeping a close if jaundiced eye on what goes on around the ship -- and they don't want to miss a thing. Between these two disparate groups, is Annie, busy gathering intel. I can't give you anymore than that. I didn't see the ending coming, and you won't either -- at least not the whole ending. Left me wondering if there will be a sequel. I'll read it if there is. NOTE: Steve Carlson does a GREAT job voicing all the many characters in this one -- including a couple of teenage girls -- and that's no mean feat for a guy who sounds like Wilfred Brimley's nephew! He really brings the folksy! Awesome job, Steve! 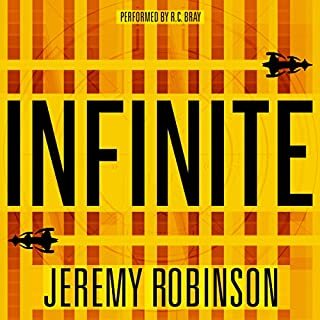 Highly Recommended -- for people who love: Well written/read sci fi audiobooks that make them laugh out loud; smart teenage girls who save the world, and quirky folks who travel in camper vans -- with guns. What a fun book. I love books that are full of interesting concepts and ideas. I expected the usual, spaceship invades, chaos ensues... This was different. Spaceship invades, nothing happens, until it does. The reason nothing happens is both interesting and important. When things do happen, it's also for both interesting and import reasons. I'd give a plot summary, but I don't think I could do better than the one listed without giving something away. I must say that I love the idea of a spaceship that lands and does nothing and it and the accompanying military guard simply becomes a weird footnote in the small town. The other reason why I like this book is that the characters make sense. They are often forced to deal with difficult and weird situations, but they deal with them in ways that I could see happening. The characters feel real, they each have their personalities and motivations I don't think I ever hit a place where I felt like they acted only to serve the plot. 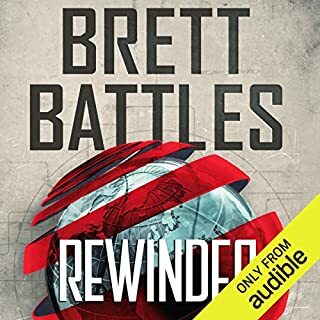 At the same time, the plot was well thought out and moved forward at a good pace (when I read a review or two online, a couple said that the plot bogged down a bit in the middle, maybe because I listened to the audio book version, but I didn't feel that way). Speaking of the Audible version, Steve Carlson did an excellent job reading this story. The characters were given a lot of life and each had a distinct voice, not always an easy thing to do, especially when the cast of characters include teen aged girls, government agents, space-ship watching kooks and more. Anyway, I really enjoyed this book. It's a good read and planted some good ideas to think about. There is so much to like about this book. 1) The characters. Oh, they were so much fun to read about, especially Annie. I want to have at girl over for a movie marathon. 2) The story. It is a scifi book and it is more than a scifi book. Kept me interested the whole way through. 3) The humor. That was an unexpected delight. I found myself laughing out loud and giggling through several passages. 4) Rated PG. Yep, a scifi book that kids can read. There was an innocence that permeated the story. I felt like I was watching a movie with my family, and we were all enjoying it without mope having to cover my kids' eyes and ears. 5) The narrator. Oh. My. Goodness! Steve Carlson can voice act his socks off! His reading style caught me up into the story so well I would find myself looking around to make sure I wasn't actually in the story myself. And he captured the humor with just the right delivery. So well done! 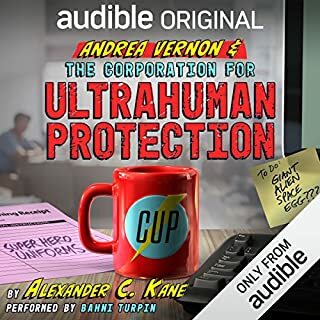 It took me a while to finish this audiobook. I kept losing interest and starting other books. But every time I looked at my library, there it was; waiting, mocking me. I finally gave in and picked it up again, hoping for a satisfying payoff at the end. Sadly, this novel didn't deliver. Besides a less than satisfying resolution, my biggest complaint is the narrator. Mr. Carlson has a very pleasant and soothing voice and smooth delivery but would be much more appropriate as the narrator for a Hallmark Christmas movie than a sci-fi novel. The main character is a 16 year old girl that sounds like a 60 year old grandpa ever time she speaks. I never could get past that. Also, during the most action packed and harrowing parts of the story, the soothing voice never changed. No fear, apprehension, or excitement ever found it's way into the narration. 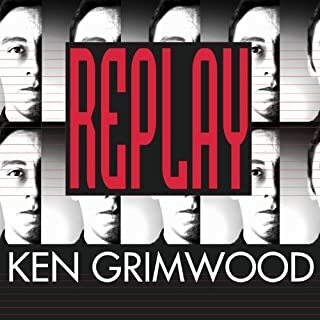 What a great time I had listening to this book. Gene Doucette has a wonderful sense of humor and Steve Carlson's timing of this humor made me laugh out loud more than five times at least. I'm 50 and enjoyed it and sent it to my 13 year old daughter because I know she will too. Whenever there is a sale, I usually pickup several books that I normally wouldn't waste a credit on. Doing this, I keep stumbling across books that were obviously written more for young adults like The 5th Wave series, Mithermages, The Ender Series, The Eragon Series, and Hunger Games Series. This is another winner in that genre. This was an engaging book with some twists and turns. The main character was a bit overdone, but she was engaging and if not 100% believable, she was entertaining. I'm not giving up my Zombie Apocalypse, military science fiction, or hard-core science fiction any time soon, but this was a pleasant change. Please note that I only gave the narrator 4 stars. 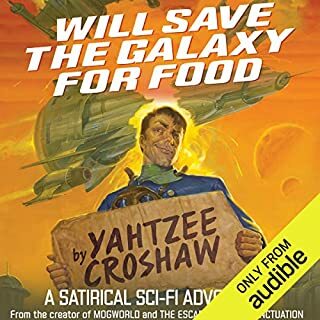 He was very good, it’s just that he didn’t distinguish himself as one of those awesome narrators or narrator-groups you look for because they add so much to the story, but then again, he did an very good job and did not weaken the story. I would definitely listen to him again. I rarely write reviews, but this was one of the most enjoyable books I have listened to. You know that when you miss the characters in the book, once you are finished, it was a great book. This was that kind of book. Thank you Gene Doucette! I thoroughly enjoyed this character driven , well-written story performed with style. Please don't look for a lot of high-tech action, but know there is enough science behind the story to make it feel credible. 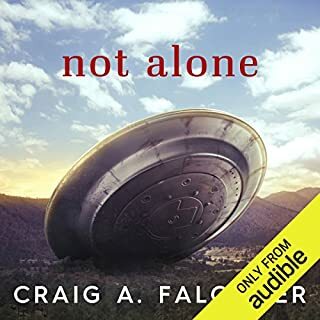 I loved how the author chose to explore how individuals handled the knowledge that we are not alone in this universe when the evidence didn't perform as expected. He also avoided plot pitfalls and kept it engaging. I admit I figured out what was going to happen before it did, but that did not take away from the experience of listening to the story at all. Totally worth a book credit! This book could have used much stronger (or any) editing at every stage. What was most disappointing about Gene Doucette’s story? This book reads like a NaNoWriMo project: word count is king. When the author has a choice to leave anything out of the story, or put it in, he always puts it in. If he can show it by way of character-driven dialogue or just tell us about it through narration, he always narrates it. If he can narrate it in 2 words or 200 words, he narrates it in 200 words. If he can add even more words to the narration by contradicting everything he’s just said, he’ll do that too. I’ll give you an example. It will be painful. The 2nd chapter (where the actual characters are first introduced) begins: “There were about 17 different ways to get to main street from Annie’s front door by bicycle. Annie had tried all of them, and like to brag about it in circumstances where such bragging was appropriate—which wasn’t all that often.” First of all what kid, even a smart or nerdy one, brags about the number of routes to main street?? Why would you remark on the fact that someone liked to brag about it but only under certain circumstances? What exactly are these circumstances where it’s “appropriate” to brag about how many routes there are into town from your house, as if anyone would care? It goes rapidly downhill from there. The next long, plodding sentence ends “…she never bothered to count them so the real number was likely closer to ten or eleven.” Okaaay but sure, she likes to brag that there are **seventeen**, an oddly specific number that implies she has counted them. But it doesn’t stop! The author then begins describing each of the routes in detail, throwing out street names and landmarks without any reference to anything the reader can have a grasp on. “Two of those ways were over bridges on the south side of main, that were impossible for her to use without having begun on the wrong side of the river.” What am I supposed to imagine here? That “two of those ways” weren’t actually ways at all? After all of this, the subject of the routes from Annie's house—or even the fact that she uses a bike—never comes up again. It’s completely irrelevant to the story. Also, all of the things you might reasonably infer about Annie from this introduction — that she’s a nerd, a liar, possibly autistic, that she obsesses over transportation — also turn out to be dead ends. The whole opening is just misleading filler, written almost on purpose to baffle your imagination. The rest of the book is just more of the same. Steve Carlson is a good narrator but the characters in this book are all written to sound the same. Not much he could do! 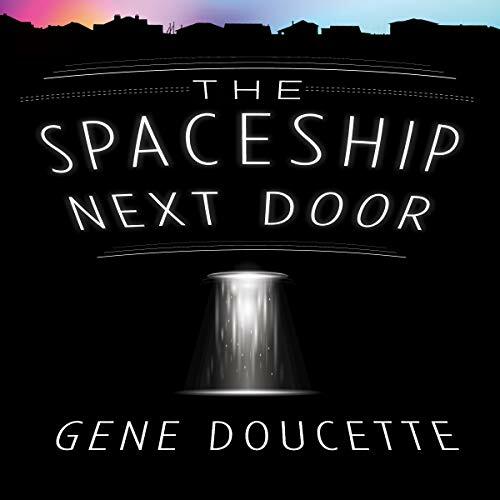 What character would you cut from The Spaceship Next Door? Without a doubt, the narrator. The ponderous novel would become a highly entertaining half-hour listen. loved it . many times laughing out loud in the car . annie outlook is great and is someone i know anyone would love to meet and chat to even without a spaceship about . Entertaining and a different take on first contact with aliens. It's never going to be a classic, but I'm happy I read it.